Pakistani soldiers stand next to what Pakistan says is the wreckage of an Indian fighter jet shot down in Pakistan-controlled Kashmir on Feb. 28. India and Pakistan, both countries that possess over a hundred nuclear warheads each, came close to the brink of war this week. But even as fighter aircraft from both nations invaded each other’s air space, a full-blown misinformation war about the conflict raged on the internet. “Misinformation has been used to start wars throughout history. It would be foolish to think that our time is the exception to the rule,” Aviv Ovadya, cofounder of the Thoughtful Technology Project, a San Francisco–based nonprofit dedicated to preventing harmful misinformation, told BuzzFeed News. On Wednesday, shortly after Pakistan shot down two Indian warplanes and captured an Indian pilot, a Facebook page called Pak Army that uses “@ArmyPakistanOfficial” as its name (spoofing the official page of the army) showed a video of a bloody aircraft pilot lying on the ground, claiming he was the captured pilot. Indian fact-checking services, including ones that are Facebook’s official fact-checking partners in India, revealed that the man in the video was actually a pilot who was injured in an airshow in India earlier this month. The video had more than 735,000 views on Facebook, and has been shared more than 32,000 times. It also continues to live on Twitter, where it went viral after being shared by a prominent Pakistani political analyst, and had more than 477,000 views at the time of this writing. 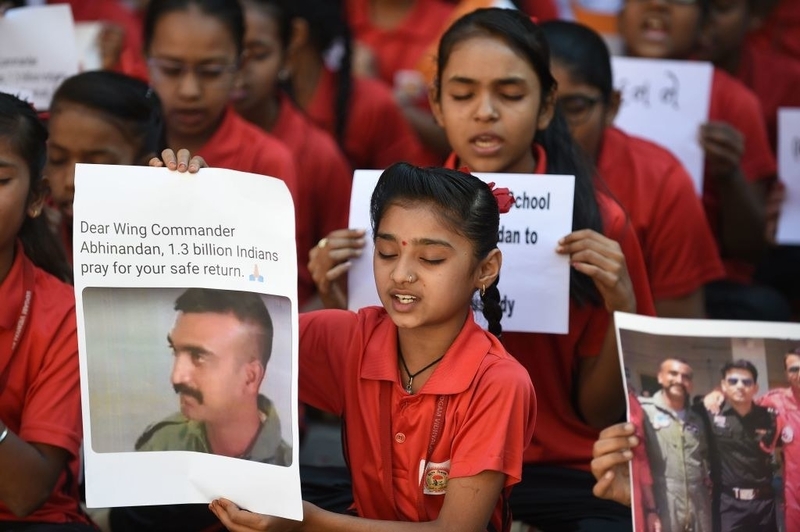 Another blurry video that went viral after India bombed terror camps in Pakistan on Tuesday claimed to show Indian aircraft executing the attack, but turned out to be a video game clip. Despite this, Indian news publications and journalists posted it on their websites and Twitter accounts. It was also shared on prominent right-wing pages on Facebook, which support India’s Hindu nationalist prime minister, Narendra Modi. At the time of this writing, the video had more than 9,000 shares and over 200,000 views on Facebook. Facebook did not respond to a BuzzFeed News request for comment about why videos that had been debunked by its own fact-checking partners were still available on the site. India and Pakistan have fought wars previously and have been engaged in a decadeslong territorial dispute over the Kashmir Valley. But this conflict is the first one to take place since social media became ubiquitous. Ever since India struck Pakistan on Tuesday, Rebelo said that Boom’s 11-person debunking team has been working nearly nonstop. Debunking stories related to the conflict is now the team’s only priority. The company, which usually flags three false stories to Facebook on normal days, now flags at least 10 stories every day. The Boom WhatsApp helpline, on which people can flag stories to be fact-checked, has been getting hundreds of messages each day. “It’s significantly more than usual,” said Rebelo. 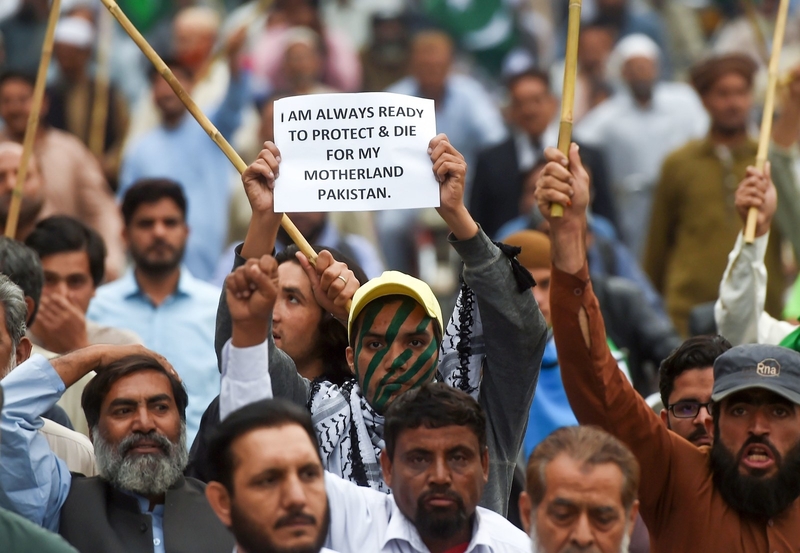 A Pakistani supporter of the Jamaat-e-Islami party holds a placard during an anti-Indian protest rally in Karachi on Feb. 28. Earlier this month, Facebook announced that it was expanding its fact-checking program in India by adding six additional fact-checking partners that would check misinformation in seven Indian languages. Misinformation around the conflict continued to fester right as a result of a lack of action from the tech platforms. On Feb. 14, the Jaish-e-Mohammad, a Pakistan-based terror group, rammed an explosive-laden car into an Indian paramilitary convoy killing 42 soldiers. Less than 24 hours after the incident, photoshopped images of Rahul Gandhi, the leader of India’s primary opposition party, and Prime Minister Modi’s chief political rival, posing with the driver of the explosive-laden car, went viral. Footage of bomb blasts from Syria and Iraq was passed off as footage of the attack. A picture of a Russian soldier that went viral claimed that he was an Indian soldier on his way to avenge the attack. Even India’s mainstream media fell for fake news, with television channels and websites passing off a photoshopped picture of Jon Bon Jovi as a photo of terrorist Abdul Rashid Ghazi, the slain mastermind behind the attack. “I’ve never seen anything like this before — the scale of fake content circulating on one story,” tweeted Trushar Barot, a former journalist who Facebook recently hired to head up its anti-misinformation efforts in India months before the country holds major national elections. On Wednesday, Ovadya, the nonprofit cofounder, tweeted a debunk from India Today, one of Facebook’s latest fact-checking partners in India about a 2016 video of a wrecked aircraft that Pakistani news media claimed was an Indian aircraft shot down by its air force. “I am really not a fan of misinformation about combat kills between nuclear powers,” he said.